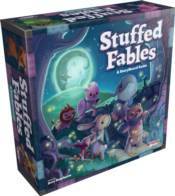 Stuffed Fables is the first "AdventureBook Game", a new product line from Plaid Hat Games in which all of the action takes place in the unique storybook � a book that acts as your rules reference, story guide, and game board, all in one! Each adventure in the game takes place over several pages of the immersive AdventureBook. The book opens flat onto the table to reveal a colorful map or other illustration central to playing the game, with choices, story, and special rules on the opposite page.